"The skin of the moon removed by the executioner-star would not be so sheer. One might compare it with a drop of water if that drop fell against nature, from the fount of the sun. A hundred yards can pass through the eye of a needle, so fine is its texture…It is so transparent and light that it looks as if one is in no dress at all but has only smeared the body with pure water". Writing in the fourteenth century, this is how Persian poet Amir Khusro described the famed muslin coming from Bengal. Seven hundred years before him, Chinese traveller Yuan Chwang compared muslin with 'the light vapours of dawn'. So thin and sheer was the celebrated fabric that some ancient sources claim that the textile could be 'pulled easily through the loop of a finger ring'. Such was the demand and fame of muslin that the Mughal Emperors used to appoint a supervisor in Dhaka to see that the richest muslins did not find their way anywhere else except to the court of Delhi. Moving forward a few hundred years, we found muslin in the iconic portraits of the fabled French Empress Marie Antoinette and Josephine Bonaparte. The writings of the acclaimed English novelist Jane Austen are full of references to muslin fabric. In her novel, 'Northanger Abbey', the central male character Henry Tilney boasted that he understood muslin 'particularly well'. According to a 1798 book titled 'A Sketch of the Topography & Statistics of Dacca' authored by James Taylor, muslins worth around 350 thousand taka used to be exported annually from Sonargaon to the overseas market. Nevertheless, with the advent of industrialisation in the late eighteenth century along with the colonial policies that favoured mechanised textiles from Europe, the craft of muslin faced tragic demise before being virtually annihilated by the 19th century. Only a few close relatives of the glorious fabric survived in the form of Jamdani and Khadi in various parts of rural Bengal, providing only a glimpse of the glorious past of the local textile. Now, after more than hundred years, a group of local scientists are working on reviving the same Phuti karpas that once gave the world the thin and sheer muslin. The 10-member research team, led by Rajshahi University Professor Dr M Monzur Hossain said that they are on the path to discern the DNA sequence of Phuti karpas -- a cotton, which is said to be long lost with the demise of muslin. "We think we are very close to reviving the original muslin cotton," said Professor Manjur. "We have travelled across the country to explore and experiment numerous types of cottons grown in Bangladesh". "In regions like greater Dhaka and Chittagong Hill Tracts, we have found some wild species of cottons, which may be closely related to the actual Phuti karpas", he added. The research team is also working closely with the Victoria and Albert Museum of London, which has a collection of hundreds of original muslin fabrics dating to the eighteenth century. "We want to collect samples from V&A Museum and perform DNA sequence on them. If successful, it will enable us to reveal what type of cotton is closely related to the one that was used for making muslin." Bangladesh Handloom Board officials said that they are planning to sign a Memorandum of Understanding (MoU) with the Victoria and Albert Museum. The planned MoU will provide them with access to research materials including necessary samples on which the DNA sequencing will be performed. The idea of reviving the muslin through the government initiative was originally mooted by the Prime Minister herself back in 2014. However, up until recently, the necessary research in this regard was carried out from the revenue budget of the Handloom Board. Notably though, the government recently formulated a Tk. 120 million project to carry out the research work and the project received the ECNEC approval in July this year. The Handloom Board has also selected a group of weavers who are currently working in Jamdani Palli of Rupganj to develop the finest of threads that may ultimately result in the weaving of the first true muslin in more than a century. "Our initial target is to develop muslins with thread count of 300 per inch. However, the ultimate goal is to produce original high quality muslin with thread count of 500 per inch. We are hopeful about reaching that target within two to three years", Professor Monzur said. The Handloom Board, however, was not the only one that has come up with such initiatives. 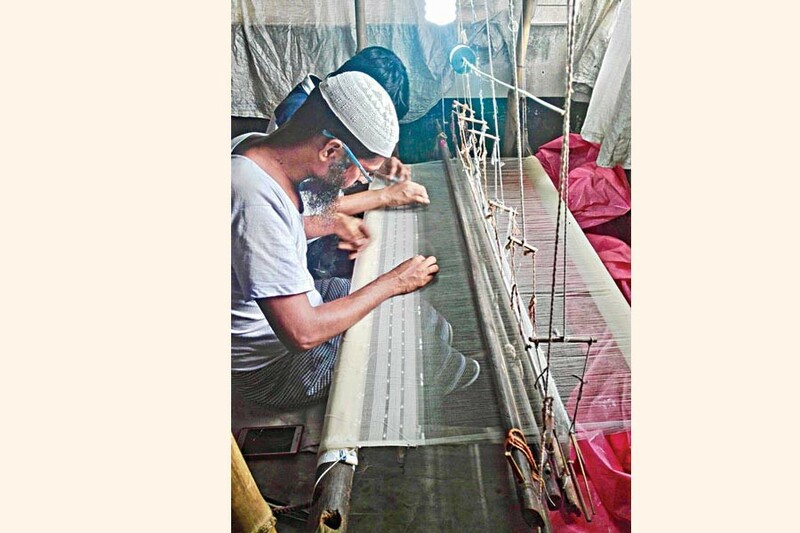 Back in 2013, multimedia organisation Drik launched an initiative known as 'Bengal Muslin' (BM) whose aims were to "highlight muslin's history, to raise awareness about its connection to Bangladesh and to restore the weaving techniques of muslin." In February 2016, Drik Gallery, in collaboration with Aarong and the National Museum, organised a month-long Muslin Festival in the city. The festival included exhibition at the National Museum, book launching, Muslin Night at the Ahsan Manjil and tours to Panam Nagar in Sonargaon -- one of the ancient centres of muslin trade. "We have been able to weave muslin above 300 count for the first time in Bangladesh, ultimately reaching 350 count," said Saiful Islam, CEO of Drik. "Our current plan is to cultivate the plant which is closest to muslin on the river banks and carry out its DNA research," Saiful said. "We want to weave more of the fine cotton cloths of high count reaching up to 500 and establish the story through our book and film," added Saiful, who has also authored the book 'Muslin- Our Story'. Attempts to revive the famed muslin are certainly a foresighted and commendable step. It is no surprise that a country that has such rich and old textile heritage has now turned out to be the second-largest exporter of readymade garment in the world after China. However, the path is still long and uncertain which requires strong coordination and further investment from both the public and private sectors. Currently, the government and business entities are working separately on reviving the art of muslin. But to ensure a quick and thorough research on the issue, both these parties need to work in unison. There is also a strong business case associated with the revival of muslin. As we have seen before in the case of Khadi and Jamdani, there is a growing market demand for traditional garments among local consumers. Learning from this trend, local boutique houses can play a big role in encouraging research, production and marketing of muslin varieties among the urban consumers and foreign tourists. Bangladesh has already a strong presence in the global RMG apparels. However, the country can bring more variation in its apparel export base by exploring the business potentials that lie within its traditional textiles. Neighbouring India has initiated similar schemes to revive the art of muslin fabric. The West Bengal government had earlier drawn up a revival package called 'Project Muslin' aimed at reviving the famed textile. Around 900 families spread around six districts of West Bengal are currently engaged in the production of the Indian version of modern muslin. The West Bengal government also launched a series of stores known as Club Muslin, under its Biswa Bangla initiative, in major airports and cities, which are selling Indian 'muslin'. Once the pride of Bengal, our handloom industry is now declining due to the lack of financial support, lack of modernisation and lack of interest amongst future weavers to continue to be in this profession. However, muslin can act as a brand ambassador for the entire traditional textile industry of Bangladesh, leading to the rejuvenation of the overall handloom industry through renewed interest and demand. According to insiders, India currently has a market of RS 4.0 billion for handloom products. If Bangladesh can gain simply 20 per cent of that chunk, this would mean a Tk. 800 million market. As per an estimate carried out by Bangladesh Handloom Board, the annual profit of around Tk. 528 thousand can be generated from a single handloom unit through the production of muslin. For Bangladesh, the key to tapping the potential export market would be to bring more variation within the design and texture of Muslin fabric and customise it according to the taste and fashion of the modern era. The country also needs to nurture a strong pool of spinners and weavers specialised in Muslin, who would have to be integrated with the overall value chain so that they get a fair slice of the profit. Above all, the government and the private sector need to work together to register muslin as an integral part of Bangladesh's cultural heritage. If Bangladesh can register itself as the originator of muslin, this will be a source of great national pride while bringing in significant foreign exchange through exports. However, necessary research in this regard should be of an international standard, since we can expect strong competition from other countries when we attempt to register our claim on this product. Lastly, let us hope that the muslin of Bangladesh will soon be a familiar name in boutique outlets across the world. Let us also hope that muslin will be the inspiration for many poems and novels throughout the globe as it was the case a few centuries earlier. Mehdi Musharraf Bhuiyan is a Special Correspondent at FE.